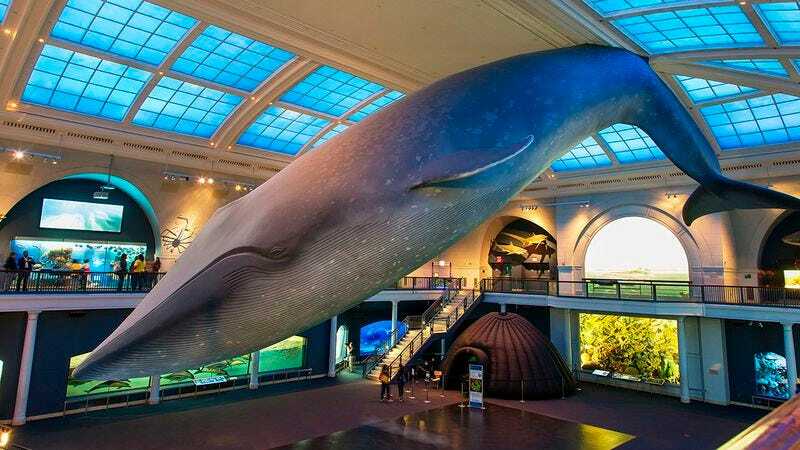 Anyone who has ever stepped foot in the American Museum of Natural History certainly remembers the enormous live whale hanging majestically over the main floor. She was an icon, the friendliest of faces welcoming visitors to the museum, but sadly, the city of New York must bid her farewell today. According to museum representatives, the whale fastened to the ceiling of the Milstein Hall of Ocean Life has died. The beloved marine mammal was 82 years old. Museum caretakers entered the building early Monday to discover the body of the gigantic whale sagging and motionless. After an attempt to revive her, the animal was declared dead, and according to the onsite marine biologist, her death appears to be the result of natural causes. From the moment she was introduced to the museum as an infant and bolted to the ceiling in 1934, the blue whale was an immediate hit with locals and tourists. Over time, she grew in popularity and size, reaching an impressive 94 feet in length. Thanks to a system of steel wires that kept the 440,000-pound mammal shackled to the ceiling, museum visitors were treated to a truly authentic deep-sea experience like no other. Schoolchildren especially loved to stand face-to-face with the gentle whale as they lined up to feed her krill or throw a bucket of salt water on her. There’s no doubt that the Hall of Ocean Life will remain a popular destination in the museum, but it’s difficult to imagine what it will look like without the powerful whale dangling over the main atrium welcoming visitors with her mournful cries. Museum officials have already begun preparations for embalming the deceased whale so that she can remain in her home for years to come. Without a doubt, visitors will be mourning this loss for a while, but hopefully they can find comfort in knowing that the whale brought so much joy to so many people during her long life.